The Vicksburg National Military Park steals much of the civil war spotlight in Central Mississippi, and rightfully so. The battle for Vicksburg was an important one for the Union and solidified their ultimate victory. That park is a glorious reminder of our past; it should be visited, often. 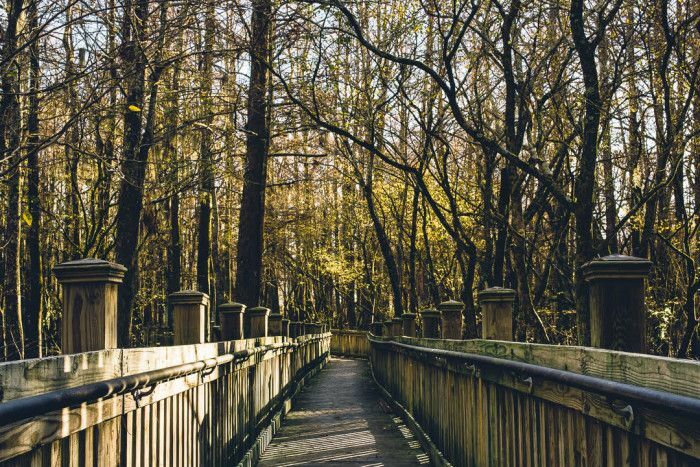 Federal oversight and Federal money make that park, along with the Natchez Trace, the jewel of the National Park System in Mississippi. But that is a day trip for another post. 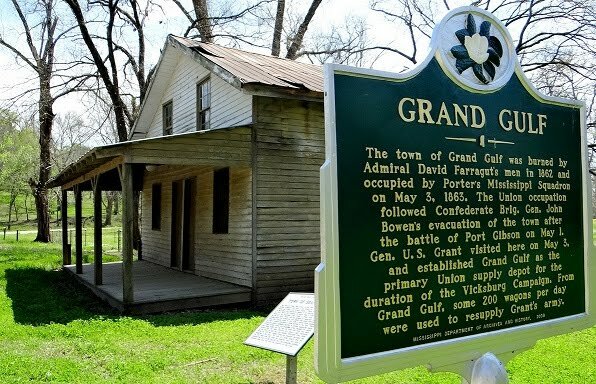 Today, I want to remind you of the State run Civil War battlefield just south of Vicksburg, and just north of Port Gibson, the Grand Gulf Military Monument Park. - The appraiser used by PRVWSD recently retired. The Board advertised for replacements and hired two -- Jean McCartyu from Madison County and Ryan Nunley from Rankin County. - Repair to the seawall in Sunrise and Paradise Pointe subdivisions continues. - The plans and design for the three comfort stations at Coal Bluff Campground, Old Trace Park and Lakeshore Park were approved. 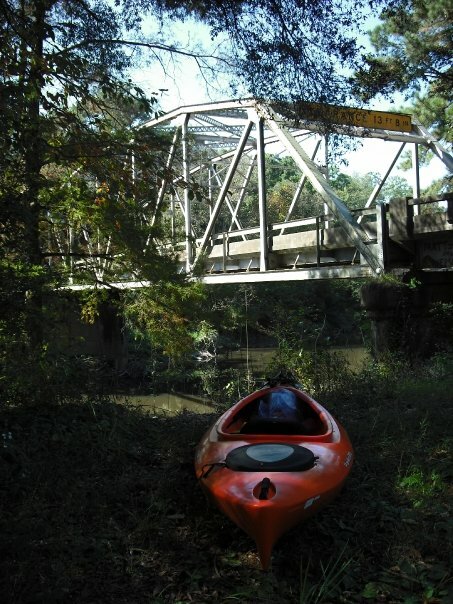 - The Board approved advertising for three new kayak launches, one for Pelahatchie Shore, one for Brown's Landing, and one for Ratliff Ferry. The one at Turtle Creek Nature Area cost $20,000! That is a bit higher than I expected. - The District's budget submission to the legislative budget committee for fiscal year 2018 is the same as fiscal year 2017. 611 Tactical and the Lee Garland/Rita Jensen Team of Re/Max Alliance present the Project First Responder -- Back the Badge Event. Friday, September 9, 2016, at the Lake House on the Rez. It starts at 6:30 p.m. and features live music (the RedHots), a live auction, and a chance to win a Honda CR-Z. The event honors the men and women of law enforcement who place their lives on the line for us every day. 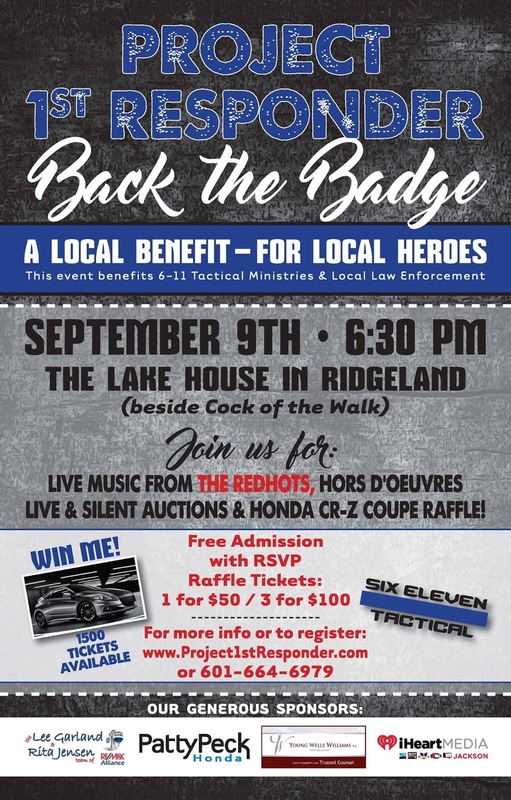 The best part about it is the money raised supports area law enforcement. The next best part about it is it's free to get in the door. RSVP's are necessary though; you can do that here. Go to the event's Facebook page to see some of the great items for auction. They have Loge Level Saints v. Panthers Tickets, Dixie Deer Blind, High Heaven Flights, and more. I have in my possession raffle tickets for the Honda CR-Z. $50 a ticket, and only 1500 are being sold. Let me know if you want one. I don't know that the link in the photo works; here is the proper link. St. Mark’s United Methodist Church at 400 Grant’s Ferry Road in Brandon is offering the following resources: GriefShare: A Grief Workshop—Journey to Healing is for those who are grieving the death of a family member or friend, and it will take place on Sundays from 2:00-4:00 starting September 11th. Also, we will offer DivorceCare, a support group for those going through separation or divorce, from 4:00-6:00 on Sundays, starting September 25th. Both groups will last for 13 weeks and include helpful videos and small-group discussion. Both have a registration fee of $20 for all the sessions. Partial Scholarships are available. For more information or to register, go to saintmarksum.org or call 601-992-2131. The registration form for the 8th Annual Foundation for the Rankin County Public Schools Golf Tournament (this year, played at Castlewoods Country Club) is below. 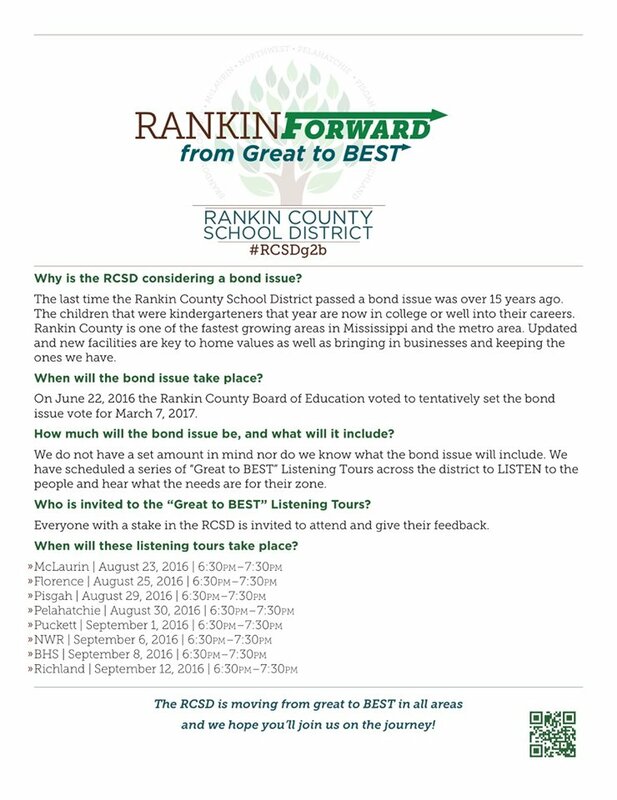 The Listening Tours start tonight, and will be in Pisgah Monday the 29th. Sixty-seven Mississippians died on the field of battle in Iraq and Afghanistan. No memorial here pays tribute to their sacrifice. Dr. Mike Lorence, USMC Veteran and board member of Stinky Feet Athletics has plans to change that. Saturday, September 3, 2016, at Flowood's Nature Park, Dr. Lorence and Stinky Feet will host the inaugural Red Eagle 67 5K race. 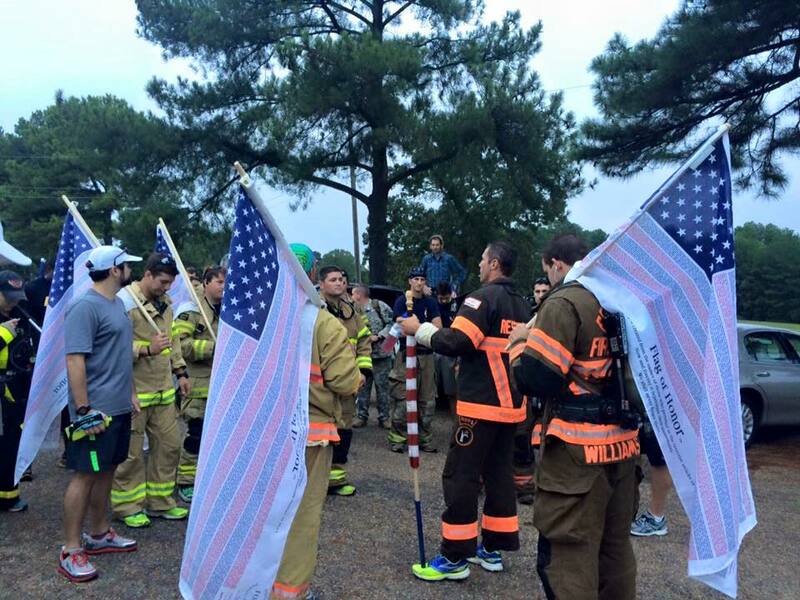 100% of the net proceeds from the race will go to Team Red White and Blue. Register here. Sisu Race Timing is facilitating the race, so you know it will be done right. Another great service to the community brought to you by Stinky Feet Athletics. An astute reader sent in these photos of the trees in the meridian of Hugh Ward Boulevard. Anyone have information on what, or who, damaged these trees? MDOT advises that the portion of Flowood Drive between Airport Road and Liberty Road (as it runs underneath Lakeland Drive) will be closed in both directions beginning this evening at 7 p.m. It will reopen at 6 a.m. Tuesday morning. Unfortunately, the purpose is not to widen that portion of Flowood Drive, but rather to perform work on the Lakeland Drive bridge. Freshii is a restaurant franchise dedicated to using entirely fresh ingredients with nothing fried or frozen. "We don't even have a freezer here in the restaurant," Newcomb said. "We get all of our ingredients from local farms and ranches every day. 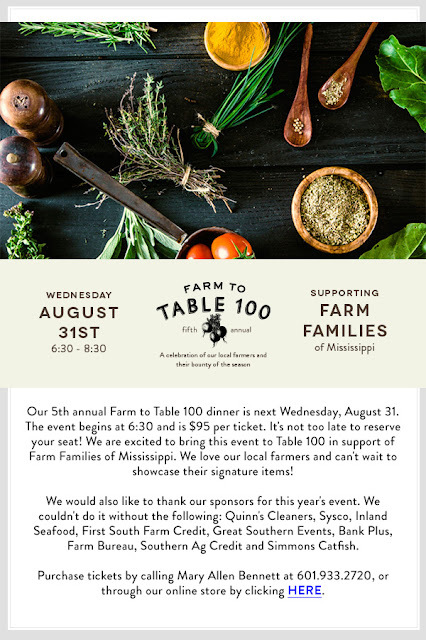 I've worked as a farmer outside of Yazoo City for 30 years, so I know the value of fresh food." Freshii's menu includes items such as wraps, yogurt, salads, smoothies, burritos, and vegetable and fruit juices. Customers can create their own custom orders from any ingredient, even with dishes such as soup. In addition to using all fresh food, Freshii also uses biodegradable bowls and utensils for the sake of the environment and donates part of all sales toward setting up gardens and food centers in Africa. Freshii is open from 8 a.m. to 9 p.m. every day. For more information, visit freshii.com. Freshii also has an app available for iPhone and Android that displays a menu and allows customers to place their orders through the app. The City of Brandon is collecting non-perishable items for flood victims in South MS and LA. There is a tremendous need. They ask for hygiene products, cleaning supplies, canned goods, bottled water, etc (no clothing). Drop off point is at the Brandon Municipal Complex (39042). They are collecting through Sunday. The flyer gives the times and further info. This morning Brandon announced the groundbreaking of the New Amphitheater and Park. Representatives from Brandon, Red Mountain Entertainment, Wier Boerner Allin Architecture, Neel-Schaffer, Inc. spoke about the many positive aspects of the Brandon Amphitheater at The Quarry. Remington-Lott Farms is a family owned business located in Canton, Mississippi. . . . Our beef are grass fed and grain finished, with no hormones. That means they graze and eat hay grown locally, being finished on grain while still living on the pasture. Our beef is dry-aged for a minimum of 14 days to maximize flavor and the tenderness of our beef. Dry aging changes beef by allowing moisture to evaporate from the muscle, making it more tender and resulting in a more flavorful taste. Due to the expensive nature of this process, this type of beef is normally only served in high-end steakhouses and restaurants. Most beef found in the grocery store has been wet-aged which is a much quicker and cheaper process. Wet-aged is normally completed within the first few days, there is little to no moisture loss, which leads to a higher weight and higher value at the market, at the expense of less flavor.
. . . Unlike the grocery who buys third-party and is focused on buying cheaply and moving large quantities at big margins, WE ARE THE PRODUCER - our focus is on one product: beef, and producing it in a healthy, quality manner. What does that mean? It means we have control over the entire process "from conception to consumption" and can provide the highest quality to you without making it cost-prohibitive. They sell at the City of Madison's Farmer's Market, the Mississippi Farmer's Market, and they have another storefront in Gluckstadt. You can find them on Facebook, too. In my humble opinion, the Rankin County School District bond will be the most important issue facing the County in 2017. Four years ago, the District handled the bond miserably (comically, really). It appears new Superintendent, Dr. Sue Townsend, is making sure to cover all her bases, especially when it comes to opening the lines of communication between the parents/public and the District. Don't want an obscene amount of bond money directed toward athletic facilities? Attend the listening tour in our local area and let your voice be heard. Overcrowding and portable classroom usage an issue for you in the Northwest Attendance Zone? Attend the listening tour in our local area and let your voice be heard. Not a big fan of public education and don't want your tax money going toward improving our future? Hey, even you have an opportunity to be heard. 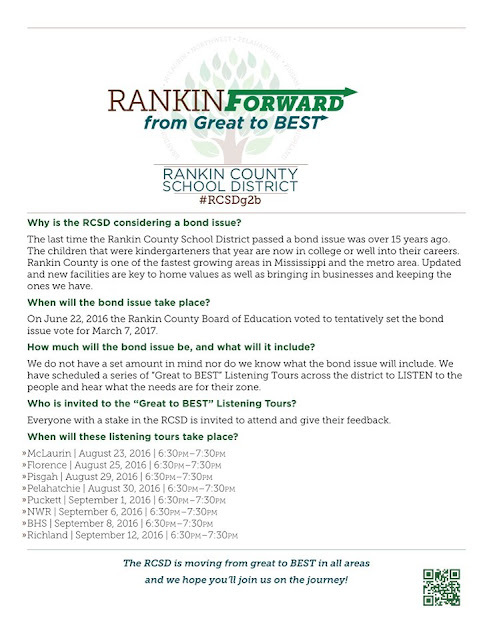 Mark your calendar for the September 6, 2016, listening tour stop at Northwest Rankin. Also, circle March 7, 2017, as the tentative date set for the vote. The rumor floated in June about a Whataburger coming to the Dogwood area proves true (in all honesty, it appears golferinmississippi had the jump on me back in April). Tip of the hat to David Hinton for confirming that Whataburger will build in the wooded area on the corner of Flowood Drive and Old Fannin Road (across from the Bank of Forest). 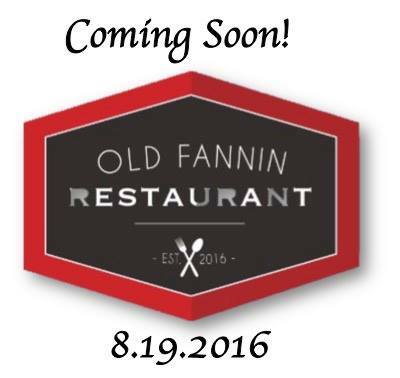 Expected to open in December. Parts of Highway 49 in Rankin County closed due to floating debris. Interstate 55 closed in Pike County. Folks having to be rescued from their cars due to flash flooding in Amite County. Flash flooding in Hancock County. Monday, August 15, 2016 4:30 p.m.
2. Review of water billing analysis in response to Donald Barney request for discussion of fees assessed on overdue water bills. 3. Review of delinquent lease collections report. 4. Approval of Per Diem and Travel Report August 2016. 6. Approval of August 2016 Docket. Monday, August 15, 2016 3:30 p.m.
1. Approval of minutes of May 16, 2016 and July 18, 2016 meeting. 2. Property Maintenance Report for July/August 2016. 3. Sunset Marina at 43 update. 5. Consideration of easement to Jessie McRight, Jr. to cross Northshore Blvd. I will be posting the agendas for the various PRVWSD committee meetings coming up. Monday, August 15, 2016 4:00 p.m.
1. Approval of minutes of July 18, 2016 meeting. 2. Approval of purchase of campground operational software. 3. Discussion and approval of changes to campground rules and guidelines. 4. Approval to advertise Timberlake Lighting Improvement project. 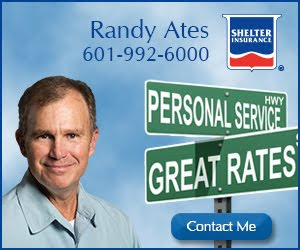 - You may not camp within 1/2 mile of a platted subdivision. - You must get a permit from the PRVWSD before you will be permitted to camp. You obtain a permit by calling the Goshen Springs Campground at 601.829.2751 (if during normal working hours), or the Control Tower at 601.992.9703 (if after hours). During the call, you must give the PRVWSD your full name, address and telephone number, your camping location, your planned duration, and the number in your party. The PRVWSD will then give you a permit number, which you must write down on a piece of paper and display on your tent flap. - You are limited to ten days per permit, but, if you are behaving yourself, it doesn't sound like it's difficult to get a subsequent permit. 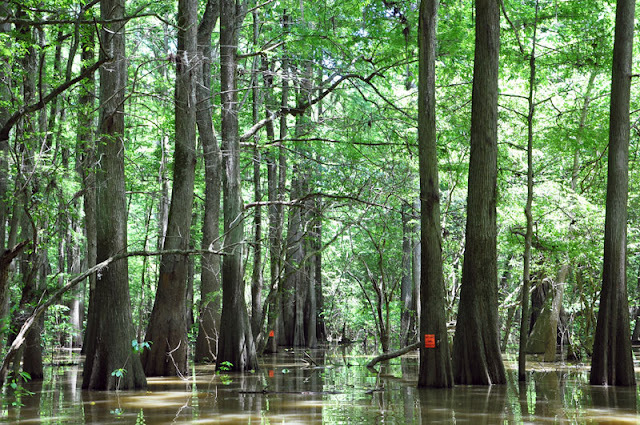 - If you are camping North of Highway 43, you must camp within sight of the Pearl River or Rez. Don't ask me why. That cuts out a lot of good camping locations. - Violations of these regulations result in a misdemeanor, and you could face up to a $500 fine. [I will present a series of posts on local day trips. My family enjoys exploring our state on weekends, especially when the temperatures drop in the Fall. The kids, though they may at first grumble, always have fun and, if nothing else, learn something. The goal is to present experiences they share with their children. The Okatoma Creek is popular, but there is a quality float much closer to home. The Strong River, in neighboring Simpson County, provides beautiful sandbars, cool water, and an outfitter. D'Lo Water Park is a part of the Pearl River Basin Development District and is located in the heart of D'Lo, Mississippi. There are a number of different float trips you can take, all detailed here. 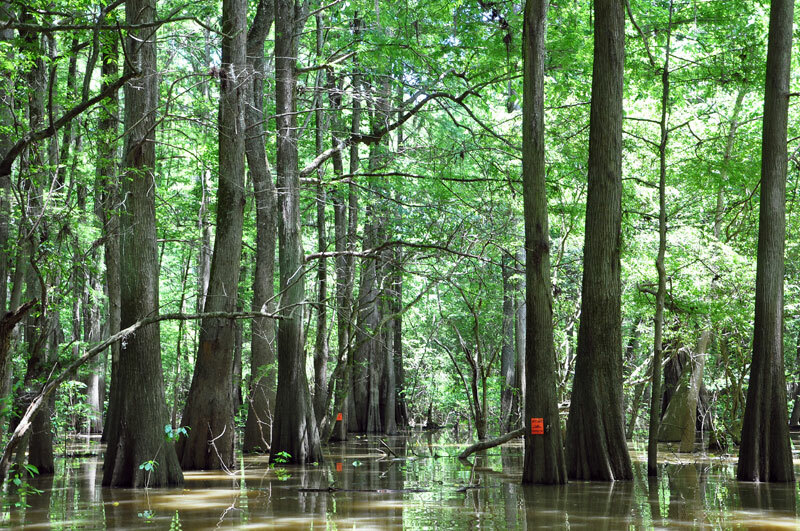 I encourage you to check the water gauge on the float trip page before heading to the water. If the water is too low on the Strong River, you will not have fun. A bicyclist was taken to the hospital Monday after a collision with a Rankin County Sheriff's vehicle. The accident happened hear N. Shore Parkway and Spillway Road, Rankin County Undersheriff Raymond Duke said. The cyclist was taken to the hospital to be treated for non-life threatening injuries. Reservoir Police Chief Perry Waggener said the call came in around 11:32 a.m. Units responded and found a deputy and a bicyclist had collided. Zoe's Kitchen. Any readers ever eaten at one? Bring your friends, family and neighbors because we are celebrating our new ownership and everyone is invited. We will have something for all ages to enjoy. For the kids we will have Inflatables, Face Painting, Jr. Golf Clinic, Snow Cones & more all at no charge. We will also have $1 Hotdogs, $2 Hamburgers, $1 Draft Beer, Live Entertainment, a Putting Contest & complimentary use of Driving Range. Come check out all of the renovations that have occurred since April 1st. In the meantime, check out the Club's new website. 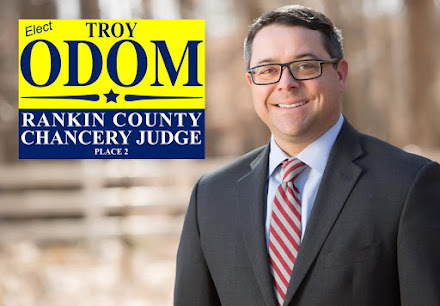 In my opinion, this is only good news for our community. A strong country club is positive for the Rez area. Mistletoe for Men is this weekend. 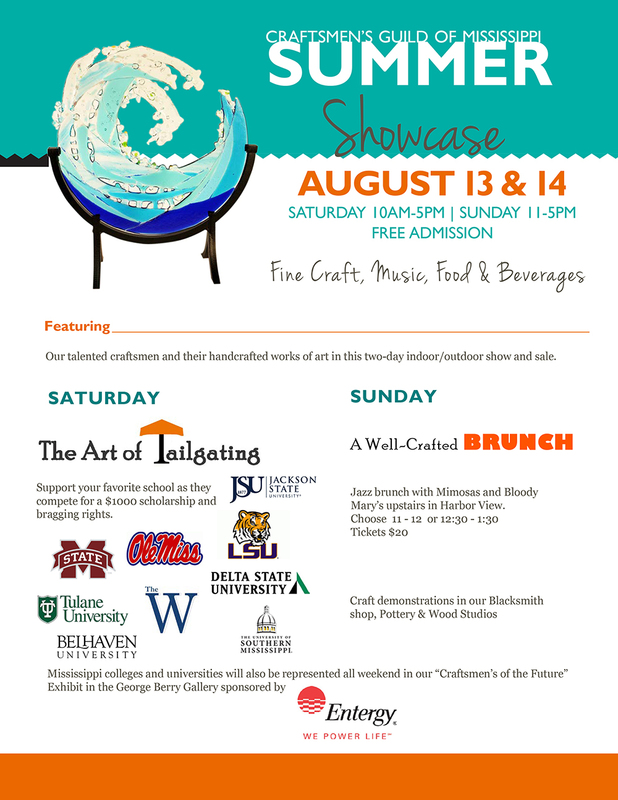 All the information you need for the Extravaganza can be obtained by clicking here, including the schedule. - Friday is Kid's Day. That's when children aged 6 through 12 get in free (kids 5 and under are free throughout the weekend). The doors open on Friday at 2 p.m. That's a few hours earlier this year. The doors close on Friday at 8 p.m.
- The HAAI Shark Encounter is new this year. This looks to be a big attraction for kids. They will exhibit twice on Friday afternoon. The exhibit will be outside. - Jason Reynolds and the High Flyin' Retrievers are back. Check the schedule for show times. They will perform twice on Friday afternoon. - Plenty of kid-centric events will take place all weekend. "Hands on" is the theme. 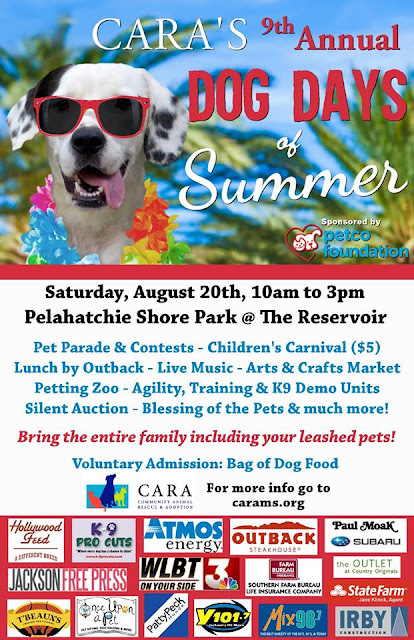 Children will enjoy the BB Gun Shoot, the Catfish Handgrabbin Free For All, the Youth Archery Range, and the Kids Casting Area. Plus, you have Live Animal Encounters at Booths 1126 & 1128, Percy King, the Snake Man Terry Vandeventer, and Talkin' Turkey with Preston Pittman. - A bunch of free giveaways for kids. Free rod and reels, grunt calls, doe calls, youth fishing grips, jewelry, t-shirts, picture books at various booths. Pick up a Ganza Program when you walk in the door to find out more. The Mustard Seed (1085 Luckney Road, Flowood), a community for adults with developmental disabilities, is hosting its own Food Truck Friday event on Aug. 19, with the goal of bringing people to the campus to see what the organization does and meet its clients. The food trucks taking part in the event are 2 for 7 Kitchen, Capitol Coney Island, Deep South Pops and One Guy Steak and Chicken. The Mustard Seed's clients will be selling bottled water and other drinks during the event, and the staff will also conduct tours of the campus and introduce visitors to the Seedsters. Royce Swayze of the Clarion Ledger wrote an article on today's blood drive. You still have time to make it. When a recent traffic accident interrupted the lives of four close friends, Madison-Ridgeland Academy responded by organizing a special blood drive to be held on campus Tuesday. The blood drive comes after two of the school’s students, MRA seniors Cole Kirby and Peyton Horton, were involved in a July 4 accident with their friends Parker Madeo, a senior at Northwest Rankin High School, and Tyler Price, a Pisgah High School graduate. Kirby did not survive the accident and the other three were left in critical condition following the crash. Rankin County Sheriff Bryan Bailey said it appeared the driver overcorrected and the Jeep they were driving left the road. Witnesses of the accident told police the Jeep flipped at least three times, ejecting all four men over a distance of about 50 to 75 yards. All three of the accident’s survivors needed blood transfusions. 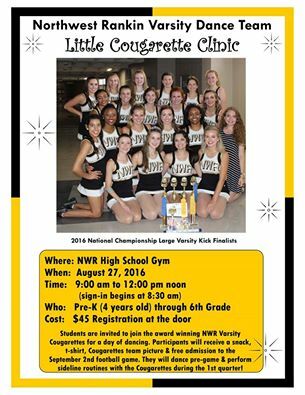 Where: Madison Ridgeland Academy's gym. 7601 Old Canton Road, Madison. When: Tuesday. From 2 p.m. to 5 p.m. Properly supervised, this Pokemon Go thing can be fun for kids. The Jackson Zoo is putting together a Pokemon Go Safari later this month. The Jackson Zoo has teamed up with Off Beat Comic Book Store to bring you Pokémon Go Safari! Join us for a special after hours Pokémon Go event from 5:00-7:00pm on Thursday, August 25th. Come dressed in your team colors and enjoy 2 hours of non-stop lures at the Zoo’s 16 Pokéstops, and 2 gyms. You can also take part in a contest while your chasing Pokemon through the zoo. Prizes will be given for the "Best Pic with a Pokemon" and for "Catching a Rare Pokemon"#JacksonZooGO on social media during event for your chance to win. Winners will be announced at 7pm at the Gertrude C. Ford Wildlife Theater and stick around for a group photo! A special Poké Shuttle train ride will be offered for $2 a person – hop on board and hatch your eggs while you ride! Concessions will be available for purchase. All Zoo pathways will be open except those in construction areas and animals will not be on exhibit. This is an ALL ages event. Memberships available for purchase online and at the gate.